Did you know that Amp has a tool to create ID cards for your students and for your staff? It's already built-in and available to you now! 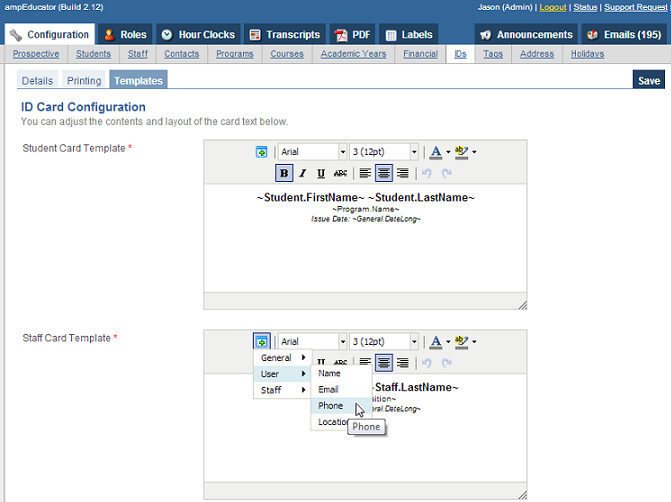 To setup the ID cards layout simply go to Configuration > IDs > Templates. You'll see the default layout is already set for both the Student and Staff templates. You can modify the existing templates and add new fields by clicking on the 'Merge Fields' icon and selecting any additional data fields you wish to be displayed on the ID card. Once your changes are done, click Save. You can also select the Printing and Details tab to make further changes to the ID card templates. If you need something for your card that is not already included we can quote you to setup a customized ID Card - contact us for more details.